Cumbia is hugely popular folk music in Colombia, an ever-present soundtrack for village parties and beyond. In the same, latin music is an immensely abused genre with different lousy and cheesy interpretations pounding in all those dance bars and BBQ joints across the globe. But this one plays in a league of its own. A cooperation of Bogotá soundwriter Mario Galeano and NYC label Names You Can Trust has peaked in a seven-inch filled with contemporary and stylish dance music that will speak also to those who necessarily do not stand ‘latin thing’. Drums are working, horns tooting and antique electric organ gives out cool sounds. ¡El Disco es Cultura! “Pitchito” is partly reminiscent of Los Hermanos’s “Quetzal”, a maya-inspired track of Detroit’s latin tech masters. This undulating and rhythmic track could be of assistance when charming a rattlesnake, if anybody dares. Except a brief song episode in “Ananas Tornillo”, both sides are filled with rolling instrumental music that current house and tribal producers could learn from. As a flashback: In the beginning of the 90s, Italian act Ramirez swept over the semi-underground dance floors, with “Hablando” being their greatest hit. Accordion and a native Colombian on vocals helped to coin the genre techno cumbia, but it’s a different story. 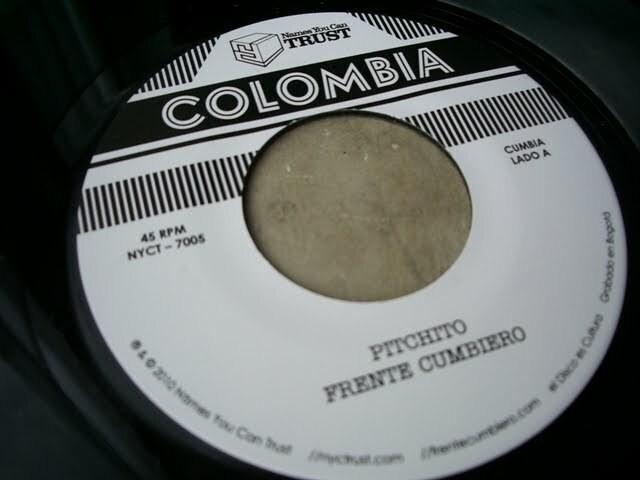 More about Frente Cumbiero tells this great interview.